This page is not intended to be a course in anatomy, but rather to serve as the basic building block of knowledge for those interested in understanding the how and why of their voice. The vocal anatomy is very complex, if you want to go deeper in this area you can look at any websites specialized in laryngology. To speak and sing correctly one needs to involve the whole body, not just the organs in charge, commonly referred to as the larynx. 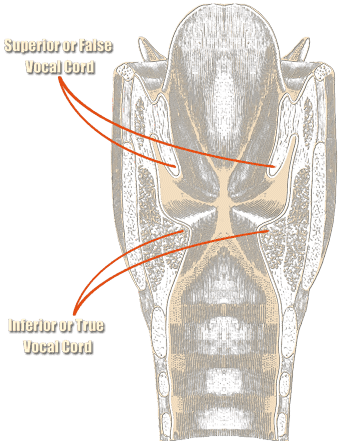 Vocalists produce sounds using the abdominal and dorsal muscles, the rib cage, the lungs and many other parts of the body other than the oral cavity. The vocal cords are nothing other than membranes able to vibrate when they are brought close together in the air flux coming from the lungs to the mouth. It's that vibration that produce the unique sound we can hear. It is only air that can make the vocal cords vibrate. The intensity of the sound depends on the pressure with which they are brought together and not from the quantity of air emitted from the lungs. Each level of vibration determines a specific note. For example in the case of the middle "C" they vibrate 256 times per second. Here is a high resolution photograph of the vocal cords shot in movement thanks to a strobe light. 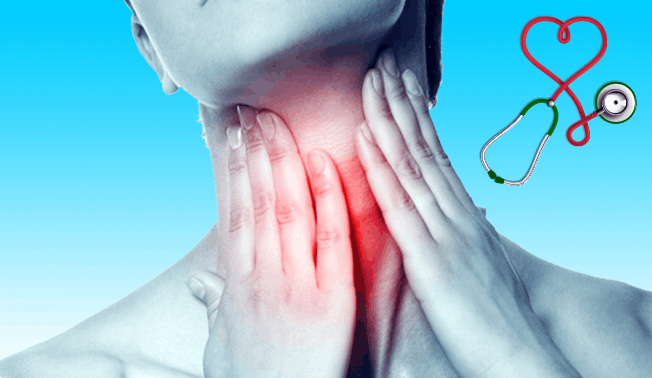 We must not confuse vocal cords with the "false" vocal cords that are situated immediately above and have the ability to block ingested solids and liquids from entering the trachea during swallowing. For the most part these do not have any role in the production of sounds. The sound is always initiated with the emission of air. The muscles of the larynx are brought close together with the two vocal cords and between themselves are able to vibrate. They remain closed until there is not enough pressure from the air emitted. With this small explanation you will be able to understand that the vocal cords do not function like those of a violin, with the sound vibration initiated by rubbing the two cords between themselves. The vocal cords are more similar to the reed of a saxophone and the secret of a good singer is all in the knowing of how to dole out the pressure of the breath emitted which, unlike what you might think, is not in any way constant in time (otherwise we would sound like a bagpipe!). As can be seen in this section on anatomy, the term "cord" is not exactly correct in that in reality they are real tissues and overlapping themselves in different layers, the most internal of which is muscular, the external of which is mucous membrane. Tongue, palate, oral cavity and nose, chest, pharynx and others anatomical structures of the human body assume all of the different roles of the resonators and therefore all participate to define the quality of the sound emitted. The sounds produced from the vocal cords are more than a buzzing and therefore the sound which we hear, spoken or sung, is produced in large part from the resonance box. In practice it is like hearing the sound produced from a cord of a violin without the resonance box of the violin itself. No one would be able to recognize that sound. When a voice teacher speaks of vocal imposition she cannot speak about is as if it were identical for all people because everyone has their own series of resonators, therefore a good teacher has to listen to the student and "move the voice" where it is most convenient for the quality of the sound.